Store at -20 degree C (regular) or -80 degree C (long term). Avoid freeze/thaw cycles. CDC25A is a member of the CDC25 family of phosphatases. CDC25A is required for progression from G1 to the S phase of the cell cycle. It activates the cyclin-dependent kinase CDC2 by removing two phosphate groups. CDC25A is specifically degraded in response to DNA damage, which prevents cells with chromosomal abnormalities from progressing through cell division. CDC25A is an oncogene, although its exact role in oncogenesis has not been demonstrated. Two transcript variants encoding different isoforms have been found for this gene. 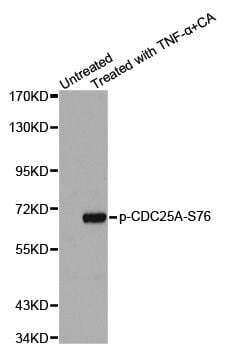 Western blot analysis of extracts from HeLa cells using phospho-CDC25A-S76 antibody. 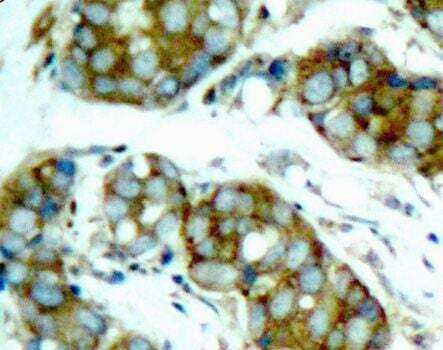 Immunohistochemistry of paraffin-embedded human breast carcinoma using phospho-CDC25A-S76 antibody. CDC25A: a member of the MPI phosphatase family. Functions as a dosage-dependent inducer in mitotic control. Required for progression from G1 to the S phase of the cell cycle. It activates the cyclin-dependent kinase CDC2 by removing two phosphate groups. CDC25A is specifically degraded in response to DNA damage, which prevents cells with chromosomal abnormalities from progressing through cell division. CDC25A is an oncogene, although its exact role in oncogenesis has not been demonstrated. Two splice variant isoforms have been described. 1. Findings suggest that inhibition of H19 long non-coding RNA (LncRNAH19) and miR-675 expression can promote migration and invasion of hepatocellular carcinoma (HCC) cells via AKT/GSK-3beta/Cdc25A signaling pathway.